In an inspired burst of think-outside-the-street strategy, a London consortium is floating an audacious plan to turn part of the River Thames into a nearly eight-mile-long, bikes-only pathway. Aimed at reducing the ever-present risk of bike-meets-lorry encounters on the city’s traffic-choked streets, the so-called Thames Deckway would hug the south bank of the river between Battersea and Canary Wharf, with the midpoint at Millennium Bridge. The sleek, futuristic-looking bikeway – think Blade Runner meets Waterworld – was trial-ballooned by the River Cycleway Consortium. The group’s leaders are British architect David Nixon and entrepreneur/artist Anna Hill, working in conjunction with design/engineering firm Arup (of Sydney Opera House fame) and Hugh Broughton Architects. The team has yet to reveal design details about just how the bikeway would float and what materials would be used, but the project, which reportedly will be privately financed, is expected to cost an estimated £600m (about $965m). Proponents say a flat-rate toll of £1.50 per biker per journey will help finance maintenance expenses. The Deckway would feature access ramps and refreshment kiosks, as well as on-board sensors that, via satellite, would relay data to bikers about things such as traffic density and flow, as well as river and weather conditions. 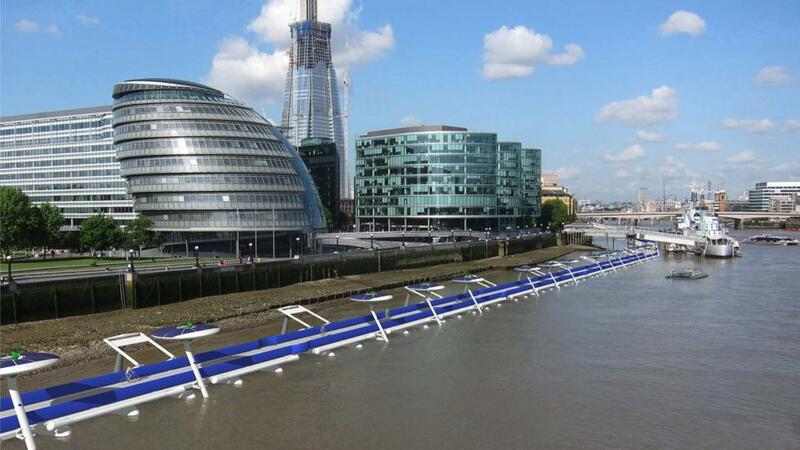 The bikeway would rise and fall with the Thames’ tides, and solar, tidal and wind energy would supply power for lighting and other needs. If approved, the bikeway – which would accommodate 12,000 bikers per hour and clip the time it takes to cross the city by 30 minutes – could be completed in as little as two years. The proposal is the latest in a series of ambitious plans designed to make London – where population is expected to grow by 12% in the next decade – safer and easier to navigate by bike. Late last year, for example, British architect and ardent cycling proponent Sir Norman Foster (the founder of world-recognized Foster + Partners and the designer of the so-called Gherkin tower), along with landscape architects Exterior Architecture and urban planners Space Syntax, unveiled a proposal for SkyCycle, an elevated bike path. This 220km-long (136-mile), three-storey-high network of car-free bike paths, punctuated by 200 access points, would follow existing urban rail lines. While a total cost wasn’t announced, a short four-mile-long first leg reportedly carries a price tag of £220m. But supporters say that’s cheaper than building more roads. In addition, London mayor and avid cyclist Boris Johnson, who’s pushing for a “cycling revolution” in London, is championing development of the “Crossrail for bike” project: 21 miles of bike paths that would be almost completely segregated from motor traffic. 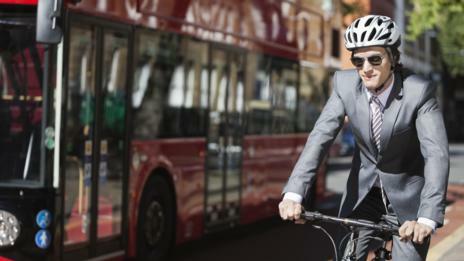 Safe biking is no idle matter in London, where bikers represent nearly 25% of rush-hour traffic in the central city. During a tragic, 13-day stretch in 2013, six bikers died on city roads. And between 2006 and 2011, the number of cycling casualties reportedly rose by 50%. Moreover, relative to motorists, cyclists in London account for a disproportionately high share of deaths and serious injuries. The biggest obstacle to Londoners eventually enjoying a leisurely bike ride on the Thames is, of course, funding. Even though proponents of such projects point to numerous benefits, such as less pollution, a healthier populace, reduced traffic congestion, fewer biking injuries and decreased fossil-fuel consumption, the road to urban-biking Nirvana is littered with visionary projects that never got rolling. Consider, for example, Toronto architect Chris Hardwicke’s Velo-City, in which cyclists would pedal through elevated glass tubes, or the $25m Veloway, a stalled proposal for an elevated bikeway in Melbourne, Australia, that would run alongside an urban rail line. Other ideas have succeeded, though, such as the Hovenring, an elevated bike roundabout that hovers like a low-tech flying saucer in the Dutch university city of Eindhoven. 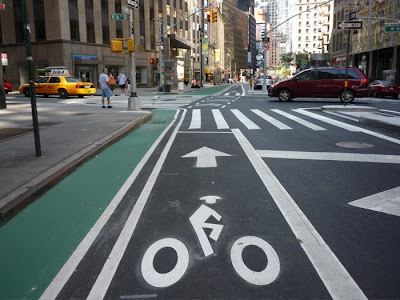 Or the on-going development of 11 miles of bike-only “superhighways” in bicycle-happy Copenhagen, the unofficial biking capital of Europe, where 50% of residents commute by bike and bicycles outnumber residents. Could the Deckway help London realise Johnson’s ambitions and wrest away the title of bike capital of Europe? Only time will tell if the idea sinks or swims. Join us for three days, two nights of great scenic cycling with NYCC friends at perhaps the best place in the country to spend a patriotic Independence Day holiday weekend – the U.S. Military Academy at West Point. We will stay at the Thayer Hotel on the USMA campus. Please note: Online registration for the All-Class Club Weekend at West Point has closed. However, we are taking names for a wait list. Please email nyccwp2010@gmail.com to place your name on the wait list and we will contact you on a first-come, first-served basis. Thank you all for your interest! Also, in compliance with NYCC's insurance regulations, membership is required to attend this event. Saturday July 3rd: In the morning, meet at Central Park West / 72nd Street, drop off your bags, and pick a group bike ride (A, B or C level) to West Point. ("C" cyclists will take the train part of the way). Spend the afternoon at your leisure in town or on the campus as you prefer. The group will enjoy a BBQ dinner on campus. Sunday July 4th: Cycle or relax in the region around West Point. Enjoy the breakfast buffet at the Thayer Hotel. Pick a ride (A, B or C) for the day. While off the bike, you can enjoy West Point’s other offerings available by bike, including theStorm King Art Center, The West Point Museum, The Dia at Beacon, the West Point campus, and various holiday celebrations in town. Sunday night the group will be aboard the River Rose for dinner and dancing while cruising on the Hudson River. Monday July 5th: After a buffet breakfast at the Thayer, you can choose a ride (A, B or C) back to Manhattan. Your bags will be delivered to a designated location in Manhattan for you to pick up. We expect to be back in the City by mid-afternoon. Please note: Specific details of the event may be subject to change, depending upon circumstances beyond our control.If needed, we will make appropriate substitutions to maintain the overall outline of the weekend as closely as possible. Government Issued Photo ID. Have in your possession (in your pocket or saddlebag, not in your luggage) a valid, current government ID with photo (e.g., driver’s license, non-driver’s license or passport) at all times. You must have your photo ID to enter/re-enter West Point. Please note: the Thayer Hotel is inside the campus so you will need your ID just to get to the hotel. Organized by volunteers. Please remember that NYCC activities, including this West Point event, are organized by volunteers. The event was priced to just cover the estimated costs. Volunteers needed. We need volunteer drivers to drive a U-Haul truck OR those with cars/vans (the bigger, the better) to carry our luggage from Central Park to West Point on Saturday, July 3rd and back to NYC on Monday, July 5th. We also need floor pumps – the more the better! Please email nyccwp2010@gmail.com if you would like to help out in any way. Hotel rooms. Rooms are double occupancy with two double beds or with one queen-size bed and one pullout sofa. Triple or Quad capacity adjoining room combos are sometimes made available to us. Let us know if you are interested by requesting more than 1 roommate. The roommates will decide for themselves as to who sleeps in which bed each night. All rooms are non-smoking. Any extra charges to the room (e.g., telephone calls, bar expenses, etc.) are not included in the quoted price and are the direct responsibility of the participant to be paid at check-out on Monday. Roommates. During registration, you are given the opportunity to pick your roommate. If you register without specifying a roommate, you can still specify a roommate at a later date. A couple of weeks before the event, a list of all registrants without roommates will be emailed to everyone on that list to facilitate choosing your own roommate. If you do not pick a roommate or if your designated roommate does not register, you will be randomly assigned a roommate of the same gender. Not included. All other expenses (including lunches, additional beverages, extra hotel charges, etc.) are not included in the price and are the direct responsibility of each participant. One price fits all. The price charged includes a number of events and everyone is charged the same price regardless of whether he/she chooses to participate in each event. For example, if someone chooses not to go on the boat cruise (or misses it because of his/her own tardiness), there will be no refund for that portion of the trip. Cancellations/refunds. No refunds are provided. However, you may find someone else to take your place if you cannot go yourself. In addition, if we have a waiting list and someone advances on the list to fill your spot, we will provide you with a refund (less a cancellation fee for unrecoverable costs). Bear in mind that the closer to the event you cancel, the more difficult it is to find substitutes. Also, remember that volunteers are organizing this event, and we have limited time to seek substitutes on your behalf. Rain or shine. The event is on rain or shine. We have generally been blessed with good weather in the past for this event. There will be no refunds in case of inclement weather. Risks. This event is subject to the usual waiver/disclaimer of the NYCC for participation in club events. How to Register. Please note: Online registration for the All-Class Club Weekend at West Point has closed.However, we are taking names for a wait list. Please emailnyccwp2010@gmail.com to place your name on the wait list and we will contact you on a first-come, first-served basis. Thank you all for your interest! Want to see some photos of this event? Click here. The Westchester Mountain Biking Association (WMBA), Westchester County NY’s mountain biking organization and advocacy group, is holding its Annual Fat Tire Festival from 10am – 4pm on Sunday, June 13, 2010 at Blue Mountain Reservation in Peekskill, New York. The Fat Tire Festival is an all-day event with lots of music, food and fun activities for the whole family. The annual festival is a great opportunity to spend a day outdoors and experience the world-renowned mountain bike trails at Blue Mountain Reservation, which was named the country’s “Best Hometown Trail” by Bike magazine in February 2009. * Live music all day from four great bands! * Festival activity zone with lots of food and fun! * Bike races for kids and teens! * Group rides around Blue Mountain’s trail network for MTBers of all levels! * Win tons of great prizes in the raffle! The Fat Tire Festival is a celebration of mountain biking camaraderie. One and all are welcome to come out and spend a day riding some of the greatest trails in New York State. Organized group rides for all ability levels, lead by experienced local guides, will be leaving throughout the day to explore the trails. Watch and compete in the many skills competitions, including a wheelie contest, fast and slow races, and the infamous, crowd-pleasing “skinny skills” contest on an ultra-narrow, raised wooden obstacle course. All Festival participants are eligible to join our Poker Rally to win great prizes. Our local bike shop sponsors, including Yorktown Cycles, Hickory & Tweed, Down Cycles, Sierra Cycles, Danny’s Cycles and Briarcliff Bikeworks have donated many more prizes to be raffled off. The Festival supports a great cause. A majority of the proceeds raised are donated to the Westchester County Friends of Parks. For 25 years the non-profit organization has worked to raise money to buy equipment, fund children’s programs, provide amenities and support the Westchester County Parks. Their vision is to keep the parks clean, green and growing. Come out and support a great cause, have some fun and give back to the Westchester County Parks.